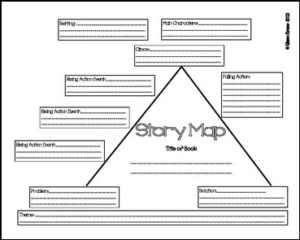 Story Map- This story map is great for intermediate students who are working with more than the basic elements of plot. This includes areas for students to write the characters, setting, problem, rising actions, climax, solution, falling action, and the theme. It works really well with summarizing fiction. When introducing this concept, I relate each element as to a roller coaster ride. (The visual of the inverted letter V helps kids remember this.) Before you get on a roller coaster, you must have the people (characters) and the place (setting). Then you’re all strapped in and getting nervous (problem). The entire ride to the top of the roller coaster is scary because of people screaming, getting higher and higher, and feeling the bumpy tracks (rising actions). Finally you get to the very top, and the ride becomes fun because you are able to relax and enjoy it (climax). At the end your fears are turned into excitement (solution) because you had fun. You learned that if you don’t take risks, you won’t have new, enjoyable experiences (theme). I know it’s kind of cheesy, but the kids really seem to connect to it and remember what each element really means.